AT&T, Verizon and T-Mobile USA will begin testing the viability of sharing 95 MHz of spectrum that is currently used by U.S. Department of Defense (DoD) and other federal agencies. Last year, the National Telecommunications and Information Administration (NTIA) proposed a spectrum sharing scheme between government and industry. 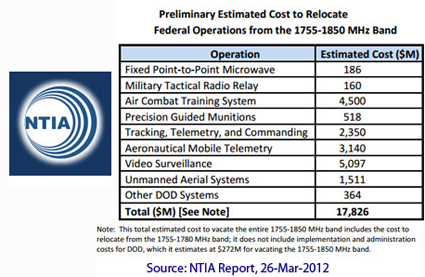 Specifically, the NTIA determined that 95 megahertz (MHz) of prime spectrum in the 1755 – 1850 MHz band could be repurposed for wireless broadband use. 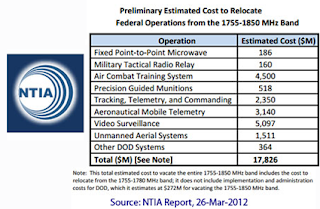 Over 20 federal agencies currently hold more than 3,100 individual frequency assignments in this band. Federal uses of this spectrum include law enforcement surveillance, military tactical communications, air combat training, precision-guided munitions, weather balloons, etc. Sharing and simulation activities are expected in the next few months to determine how federal use of this spectrum is impacted by the introduction of commercial mobile broadband services in this band. The testing will involve low power mobile broadband uplinks (base station receivers) and four uses identified by NTIA, including air combat training systems, aeronautical mobile telemetry, satellite command and control, and small unmanned aerial vehicles. On a blog posting, Stacey Black, AT&T Assistant Vice President of Federal Regulatory, stated "I want to emphasize that we continue to believe that clearing and reallocating is the best approach to freeing up much needed spectrum for commercial mobile broadband use. The existing exclusive licensing regime has resulted in billions of dollars in wireless infrastructure investment, enabling the U.S. to lead the way in the global mobile broadband marketplace. While clearing spectrum for exclusive commercial licensing must remain the top priority, when that is neither time nor cost effective, AT&T supports exploring sharing arrangements." 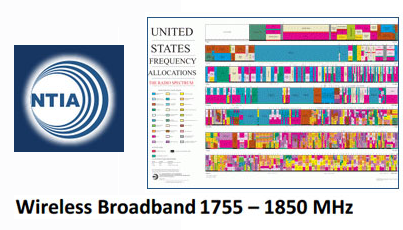 In June 2010, President Obama signed a Presidential Memorandum committing the federal government to make available 500 MHz of federal and commercial spectrum available to new mobile broadband usage over the next 10 years. The effort, which would nearly double the amount of commercial spectrum currently available for commercial use, was expected to result new rounds of spectrum auctions. 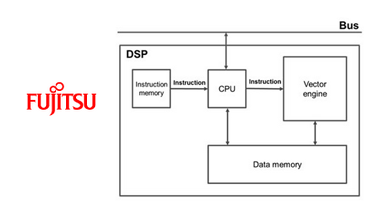 Fujitsu Laboratories has developed a digital signal processor (DSP) for mobile device baseband processing that uses the same vector processing architecture employed in supercomputers. Fujitsu's 28-nanometer DSP runs at 250 MHz and is capable of processing data at 12 GOPS (12 billion operations per second). Excluding memory, the DSP measures only 0.4 mm2, and it consumes 30 milliwatts (mW) of power, 20% less than existing DSPs. It can run highly repetitive processes common in LTE and other wireless processes. Fujitsu said that while typical processors execute a single instruction on a single piece of data at a time (scalar data), its vector processor will execute a single instruction on multiple pieces of data (vector data) at a time. The company said this vector approach is especially effective with LTE, which uses OFDM modulation and communicates by bundling data that is carried by up to 1,200 "subcarriers" in a wireless signal. The vector DSP can be used to extract information from an incoming signal. Fujitsu said its new DSP can lengthen talk times, usage times and standby times for smartphones and other mobile devices. In addition, the DSP can handle ongoing upgrades to the signal processing algorithm.